Wishing you all a very Happy Holidays! This is Diane from Recipes for our Daily Bread and Our American Travels. I am thrilled to be able to share these stuffed chocolate pretzels with you in time for your holiday parties. Thank you Jennifer for allowing me to share recipes with your readers this year. You are the best! What do I love about these Chocolate Pretzels? They can be stuffed and topped with anything. 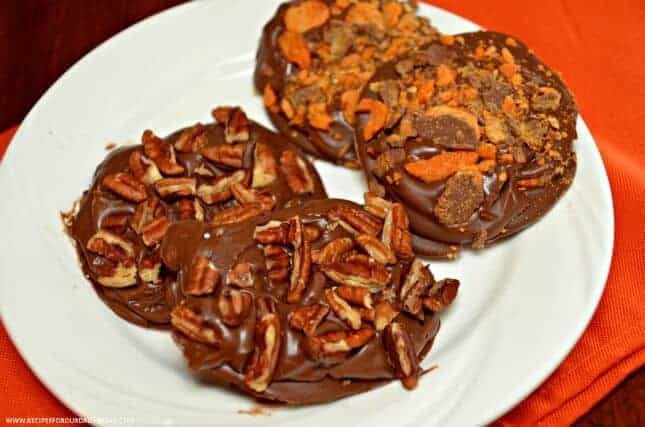 I have included recipes for a Turtle Chocolate Pretzel stuffed with caramel and a Butterfinger Pretzel stuffed with peanut butter. A Holiday Treat the entire family can help make. We love chocolate covered pretzels, especially when loaded with different types of chocolate, caramel, candy, nuts, and more. I had a bag of the large twisted pretzels not the rods but the kind that has three large holes in them. I decided to melt a little chocolate and add the large pretzel on top of it. 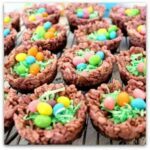 After the chocolate with the pretzel dried, my teens and I added a gooey topping to each of centers in the pretzel. I then decided to cover the whole thing with additional chocolate. Before the chocolate dries, we topped it with candy or nuts. How did I stuff these chocolate pretzels? I made Turtle pretzels and Butterfinger Pretzels. To make the turtle pretzels, I added about a teaspoon of salted caramel to the center of each hole in the pretzel. After coating it with more chocolate, I added chopped pecans before the chocolate dries. When you bite into it, the caramel is a creamy surprise. To make the Butterfinger Pretzels, I added about a teaspoon of peanut butter to the center of each hole in the pretzel. I then coated everything with additional chocolate. After the chocolate dries, I topped it off with crushed butterfingers. Additional ideas for stuffed pretzels. We also made a stuffed pretzel using the following. White chocolate stuffed with marshmallow cream and topped with Mini Christmas M & M’s. The M & M’s were festive on top of the white chocolate. Milk chocolate stuffed with caramel and topped with crushed Health bars. 1 large bag of Pretzel Thins Twisted – The larger the holes in the pretzels the better. The larger holes will hold more filling. I used Kroger brand pretzels. They were the size of a large cookie. 2 Tablespoons of ShorteningMelt in the microwave for one minute. Stir constantly until smooth and creamy. If needed, put it back int he microwave for another 15 seconds. 1 tablespoon of shortening.Melt on high one minute. Stir constantly until smooth and creamy. Add about 1 – 2 tablespoons of melted chocolate to wax or parchment paper – this will depend on the size of your pretzels. Your pretzel should fit completely into the chocolate. Allow it to dry – I added parchment paper to a small pan and placed the whole thing in the freezer for about five minutes but the chocolate will also dry on sitting on the counter. After adding the pretzel to the chocolate and it hardens, I filled the center of the pretzels with a teaspoon of caramel in each hole. I covered everything with more chocolate and topped it with chopped pecans before it dried. After adding the pretzel to the chocolate and it hardens, I filled the center of the pretzels with a teaspoon of peanut butter in each hole. I covered everything with more chocolate and topped it with crushed butterfingers before it dried. After topping the pretzels with your favorite goodies, allow everything to dry until you can pick it up easily. Thank you again for allowing me to share my stuffed pretzel treats with your readers. Kids will love making these trips. Warming! You may not have a final product because they disappeared so fast. 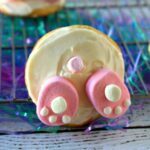 Oh my goodness do these look YUMMY! Diane, you outdid yourself.